We aim to enable students to become confident, articulate communicators in both spoken and written English and to nurture a lifelong love of literature. A creative approach to the curriculum will enable students to develop a genuine enthusiasm for English as well as enabling them to use their spoken and written English in a range of forms and with increasing levels of sophistication as they progress through the school. English is taught in six dedicated English classrooms and Drama is taught in the Drama Hall and in the Drama Studio in the Sixth Form Centre. We have very high expectations of all our students and challenge each of them to achieve their personal best. As a core subject, all students will study English Language and English Literature at GCSE. In 2018 30% of our students achieved a grade 7, 8 or 9 in English Language or Literature and 8.3% achieved the highest grade of 9 in English Language. Students study a range of literary and non-literary texts throughout Key Stage 3. They study a Shakespeare play every year. Novels, poems and short stories from the Literary Heritage are studied as well as literature from other cultures. Students have seven hour long periods of English over the two week timetable. 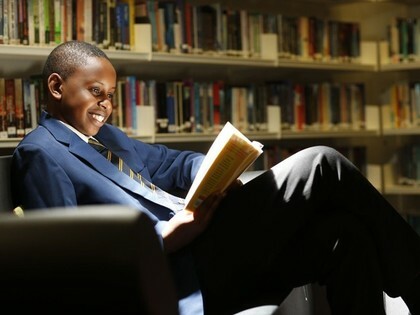 Good literacy underpins all our work and students in Years 7, 8 and 9 have a dedicated library lesson once a fortnight in which we focus on independent reading and developing a wider range of vocabulary as well as developing accuracy in spelling, punctuation and grammar. Students develop their writing skills through the analysis and practice of diverse written assignments for different audiences and purposes. All students study drama in Key Stage 3. Our English and Drama topics are taught in half-termly modules and students have a written assessment at the end of each module. Students' progress is assessed regularly and tracked against target grades. Each Key Stage 3 module is accompanied by a homework booklet containing a range of homework tasks, differentiated by ability, for each week. Currently, all students at Key Stage 4 are entered for AQA GCSE English Language and GCSE English Literature. They are expected to do 3-4 hours of homework and revision each week. Students are taught in ability based sets and teachers plan differentiated programmes which take into account the needs and academic targets of the individual students in their classes. Students' progress is tracked and discussed regularly and intervention put in place where required. Students study “Romeo and Juliet”, a 19th century novel, “An Inspector Calls” and a range of poetry. They are taught to respond to and analyse a range of fiction and non-fiction texts from the nineteenth, twentieth and twenty first centuries. They also develop their own writing skills for a range of audiences and purposes. The reformed GCSE are 100% exam based. GCSE Paper One (50% of the marks): Fiction. Explorations in creative reading and writing. GCSE Paper Two (50% of the marks): Non-Fiction. Writers' perspectives and viewpoints. We offer English Literature as a two year linear course following the Edexcel specification. Students develop and extend their reading repertoire and are expected to carry out a significant amount of independent reading and research. We believe that it is important for students to experience the richness and variety of English and drama outside the classroom. We enter students' writing for local and national competitions and have been successful over many years. Each year we take part in the Jack Petchey Speak Out Challenge, a public speaking competition, and the reading competition, Battle of the Books. We arrange theatre visits and poetry reading events to support the students' study of literature and attend the Poetry Live! Event whilst sixth form students get the opportunity to attend lectures and conferences on their set texts. We also have close links with the Orange Tree Theatre Company, attend productions at their theatre in Richmond and invite them in each year to work with students across the age range. There is a thriving drama club and school productions are a regular and successful feature of the school. A significant number of students go on to study English Language and Literature at AS and A level. Many continue to study the subject at degree level. One former student is reading English Literature at Oxford University. Further and higher qualifications in English provide a platform for careers in a wide range of subjects including journalism, the law, teaching, marketing and human resources. A Level students can log on to emagazine (login details available from English teachers and Sarah Garrett - Learning Resource Centre Manager). There are a range of reading lists and subject specific publications in the Learning Resources Centre.